Major ship buyer GMS has called upon the European Commission to think carefully before banning beaching as an option for recycling European ships following the very positive study visits by a Japanese delegation and representatives from the Danish Shipping Association (DSA) to shipyards in Alang. A beaching ban by the European Commission will be counterproductive as it would discourage improvements in the ship recycling industries of South Asia. Firstly, it will mean that EU-flagged ships will be able to be recycled only in Turkey and China. The Turkish recycling market has a finite capacity with only 20 small yards and China’s demand for steel from recycled ships varies greatly year to year. Currently there is little demand in China for scrap steel and there has not been for about a year-and-a-half. This situation will undoubtedly lead to some EU-flagged ships changing flag to register with states where no such ban is imposed to allow them a realistic choice of recycling destinations. Secondly, prices will also be severely affected as EU-registered ships forced to deal with only Turkish yards could face a collapse in value. Traditionally, southern Asian prices have been higher by about 40–60% than in Turkey and China due to the higher demand and value for ship steel, machinery, equipment, spares and ancillary items. Incidentally, most of these items are re-used; a more environmentally friendly option. Banning beaching will only discourage other yards in the region from raising standards, thereby destroying the current ‘virtuous circle’ of improvements among shipyard owners in Alang. If all yards in India are excluded from European approval, regardless of the improvements they have made in their infrastructure and work procedures, they will have no interest whatsoever to support their government’s ratification of the Hong Kong Convention. Finally, and perhaps most importantly, for the European Commission to base its decision on beaching on secondary data (instead of primary investigation) is illogical. There is no reasonable justification for the European Commission to punish its own members without thorough analysis. are making huge improvements to working conditions for the EU to make a decision without seeing for themselves the positive changes made in the region. GMS would be happy to organize such a visit,” said Dr Anil Sharma founder and CEO of GMS. Established in 1992, GMS is the world’s largest buyer of ships, having concluded into the Indian sub-continent during 2014, more vessels and lightweight ships than the next four competitors combined and buying more ships on an ‘as is, where is’ basis than any other cash buyer in the world. It is the world’s FIRST ISO 9001 certified cash buyer with a proven track record spanning over two decades, and with more than 3,000 deals under its belt, it has grown to become the leader of the ship recycling industry. Many of the world’s largest ship owners sell their vessels exclusively to GMS. In 2012 alone the company recycled over 16.5 million DWT (i.e. roughly 300 ships) or nearly one third of the world’s fleet sold for recycling. Over the years GMS has succeeded in helping to modernize the ship recycling industry and, through its efforts, has done much to strengthen the credibility and transparency of the ship recycling sector. It has invested considerable resources into green recycling and continues to support ship recycling yards around the world in both an advisory and financial capacity. 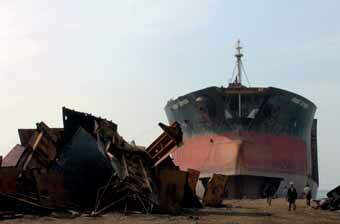 To date it has been responsible for 65% of the vessels which were offered for responsible ship recycling in India. Recently, with technical assistance of GMS, four ship recycling yards in Bangladesh were able to obtain Certification for ISO 9001, 14001, 18001 and 30,000. GMS is also the first and only cash buyer to develop a Green Ship Recycling Program (GSRP) together with Germanischer Lloyd (GL) to meet the highest standards of Corporate Social Responsibility (CSR) in the ship recycling industry. GMS continues to lead the ship recycling industry with innovative and practical solutions. It participated in the deliberations leading up to IMO’s Hong Kong Convention (HKC) on Safe & Responsible Ship Recycling and over the years has become the acknowledged ‘voice’ of the recycling industry in international fora. GMS is the only cash buyer in the world with multiple offices in the USA, Germany, Dubai, China, Singapore, and Japan as well as exclusive representatives in all five of the major recycling markets including India, Pakistan, Bangladesh, China and Turkey. The GMS Weekly newsletter is the most quoted and longest running report in the Ship Recycling Industry.